The popular digestive enhanced French Lick’s cachet. Movie stars, politicians and socialites—from Barrymore to Roosevelt—streamed in. 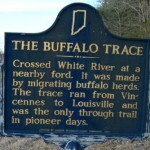 Mineral springs attracted settlers to French Lick in the early 1800s. A century later, a massive tourist industry had sprung up in Orange County for the same reason. Widely held faith in the therapeutic powers of the local waters contributed to the appeal of a resort that had been established there in the 1830s. 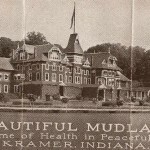 In 1903, Dr. George Kahle reported at the annual session of the Indiana State Medical Society that patients who’d taken the cure at French Lick had experienced unparalleled recoveries from ailments ranging from rheumatism to gout. There were three sources of the potion that drew vacationers during the spring and fall “watering seasons”: one spring was named Bowles for the spa’s first owner and another Proserpine, for the goddess of spring. But the water from a spring named for the god of the underworld was most heavily branded. Mere steps inside the French Lick Hotel, arriving guests could down their first dose of Pluto Water at the Pluto Bar. Sales of the Hoosier tonic grew 25-fold, from 1903 to 1919, when it took 450 railroad cars to transport the bottler’s output. Sold in drugstores around the world and awarded a blue ribbon at the World’s Fair in Paris, Pluto Water’s much-lauded laxative quality was immortalized in the advertising slogan, “When Nature Won’t, Pluto Will.” The popular digestive enhanced French Lick’s cachet. Movie stars, politicians and socialites—from Barrymore to Roosevelt—streamed in. Although the Pluto Water operation split from that of the resort in 1948, production continued until 1971, when Lithium, which occurred naturally in the water, was classified as a controlled substance indicated for the treatment of bipolar disorder.